Friends of Kids with Cancer | Golden Oak Lending Donated over $7,000 to Help Kids with Cancer! 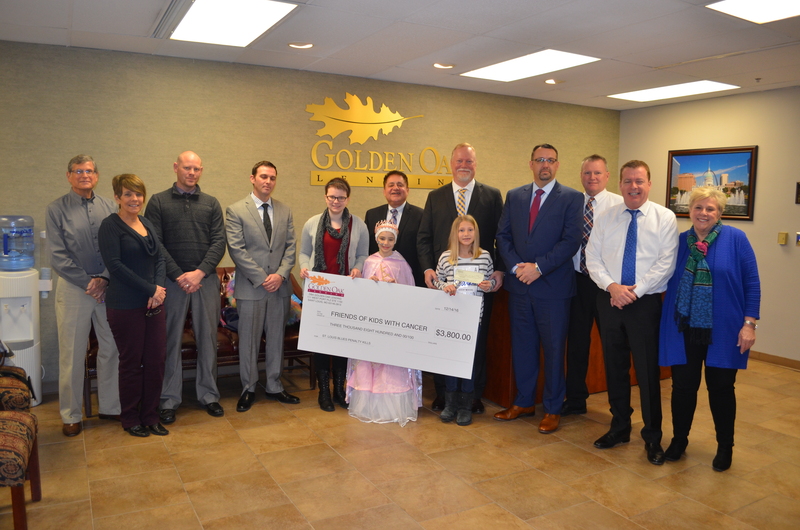 Golden Oak Lending Donated over $7,000 to Help Kids with Cancer! James Hawkins, President of Golden Oak Lending, presented a check to “Friends” for over $7,000 on December 28 at their Westport office. The company sponsored the St. Louis Blues “Penalty Kill” during 2015-2016 season at each home game. For each penalty the Blues killed without a score, Golden Oak Lending donated $100, and for each short-handed goal the Blues made during a penalty, $500 was donated. The Penalty Kill sponsorship raised $3,800 for “Friends!” In addition to this donation, the company matched employee holiday contributions of $1,746 amounting to $3,492. Everyone at Golden Oak Lending has a true heart of gold which is evident not only with the employees but even in their families. James Hawkins passed on the importance of philanthropy to his children who have taught us all what it means to give back to those who need it most. Braden is 15-years-old and worked hard to save up $2,500 to purchase a car when he turns 16 in February of next year. However, when Braden heard about “Friends” and the difficult battle kids with cancer face, he generously donated half of what he raised to our organization. $1,250 is a lot of money for a teenager to save and donate to charity. Braden’s younger sister, Lakyn, wanted to give back to our kids as well, so she got creative. 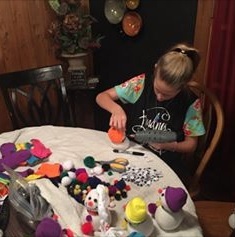 Lakyn made cute and colorful snowmen which she sold for $6 each and donated the proceeds to “Friends.” Lakyn ended up raising $200 from her crafty snowmen fundraiser and Golden Oak Lending matched what she raised. Wow! We are continually humbled by how much kids are helping kids. Golden Oak Lending has been a loyal supporter of our mission and consistently contributes to our fundraisers, including the Golf Tournament. We are grateful for our friends at Golden Oak Lending. Thank you for helping kids with cancer…be kids!